Trying to please everyone? 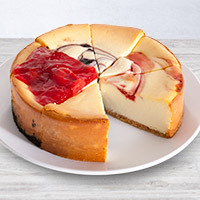 This sampler is comprised of our creamy Amaretto, sweet Strawberry, decadent Turtle, and rich New York cheesecakes creating a unique dessert that offers a perfect slice for everyone. We bought this for spouses mother for Christmas and she loved it. Pleased to see that the basket I ordered was delivered promptly. I bought this for office staff appreciation...they loved it! The cheesecake was perfect... a treat that was enjoyed by all - even though it was a gift for one :-) Having the sample option gave variety to the gift. Ordered this as a birthday present for my son. Knowing his affection for our homemade cheesecake I was hoping this would be a welcome substitute. He admits that it's not what he is used to, but a WAY better option that the store bought versions or anything from the local bakeries. It arrived in great condition (cold and undamaged) and RIGHT ON TIME. Thanks! Sent the sampler to my sister who shared it with friends. She reported that one guest who does not like cheesecake devoured an entire slice. I had to travel overseas prior to Valentines Day. I looked on line for quite a bit before I found exactly what I knew my wife would really like the most. I was skeptical of their timing, but to their word, they delivered perfectly on the Day, even when my wife was home for lunch from work. PERFECT! Then when she opened it and saw the photo of me blowing her a kiss, the true icing on the cake!! Congrats Gourmet Cheesecake, job well done. You made her day and I thank you for that. I sent a Gourmet Cheesecake Sampler for my nephew birthday. It came perfectly on time. The card with personalized picture was a great addition! My family was very pleasantly surprised. Thank you! Bought it for my sister's birthday and the entire family loved it! Didn't notice anywhere that it was frozen though.. It needed a day to defrost. 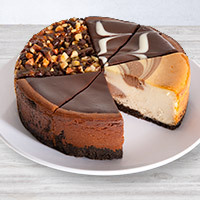 I ordered the cheesecake sampler as a birthday gift for my son who is a huge cheesecake fan. He was thrilled to receive his birthday surprise and said it was delicious. Thanks for helping to make his birthday special! My daughter a freshman at a University 8 hours away from home and celebrating her birthday for the first time without us. 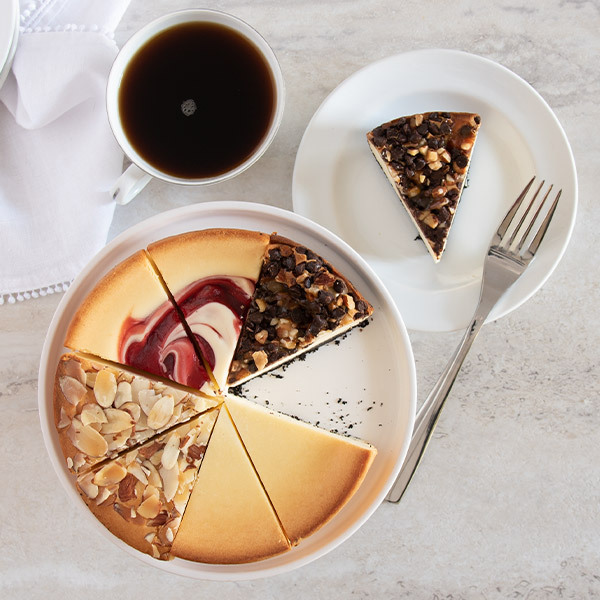 She has always had cheesecakes for birthdays and thanks to this company this birthday was no different. The sampler was great, it arrived on time, and was tasty . It was a definite hit with her and her friends. First time purchase, delivery was prompt and much appreciated. Orderd the gourmet cheesecake as a gift. Ordered was delivered right on time! Great selection on cheesecake and excellent service. Will use them again! Delivery of this cheesecake to my relative within a day and half - to Queens NY- made her day. Everyone will love sharing this treat. Definitely buy my family one next.